The central theme of this practical book is that we can build much better computer systems if we re-engineer their business information systems. 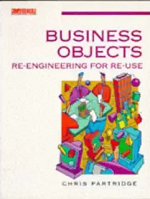 The book provides the reader with the tools, techniques and understanding of object orientation techniques/re-engineering to enable him or her to improve or build business computing/information systems. As well as showing how, this book also shows that information re-engineering can deliver much better systems by helping the reader to understand why and how the benefits are gained. It shows how to actually go about using what has been learned in the book to re-engineer a system. This may be a commercial project taking months or a personal one done over a couple of weekends. It looks at the problems and offers solutions in an easy practical way. This book should be of interest to system designers, analysts and programmers, information systems managers, database designers and IT development managers.